Made of stainless steel, easy to clean and do not harm for people. Perfect for household, cake shop, coffee shop, restaurant, etc. Combines good product design and functionality. Non-stick surface offers reinforced coating that provides quick release and easy clean-up. 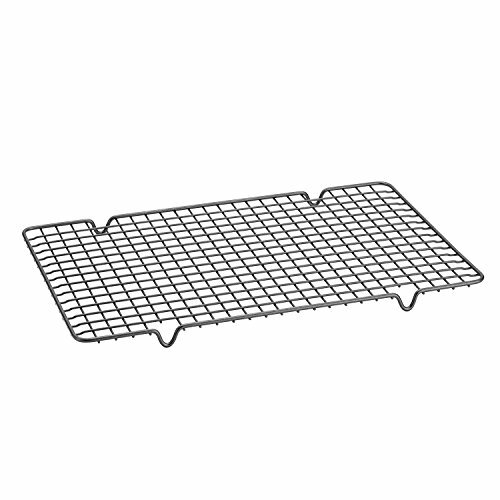 Sturdy commercial-weight cooling grid for cookies and other baked goods. ♥Do not use sharp metal products, scouring pads and chemical cleaners. ♥Do not leave baked or unbaked products in the appliance. The accumulation of moisture, sugar, and starch in the product can corrode and oxidize the metal material on the bottom of the coating. ♥Try to avoid collisions and friction caused by careless operation, which will result in abrasion or scratching of the non-stick coating. ♥Be careful when storing and stacking, and keep the appliance dry. Do not store it in a damp place. ♥When using, it should be taken up and down to avoid causing the non-stick coating to wear or scratch. NONSTICK COATING: Non-stick surface offers reinforced coating that provides quick release and easy clean-up. PERFECT SIZE: Great for compact kitchens, toaster ovens and RV's, fits perfectly inside of a standard. DURABILITY: These 100% stainless steel cooling racks are designed for maximum strength and durability, can hold up to 40 lbs of food without the rack bowing. WIDE USE: Perfect for household, cake shop, coffee shop, restaurant, etc. SAFELY TO USE: Oven-Safe to 575˚F with 1-inch Legs in Height for optimal airflow, allows air to circulate around all sides of the pan for perfect cooking and cooling.